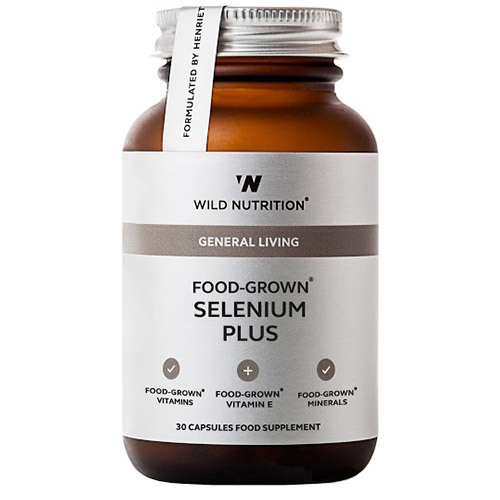 Wild Nutrition`s Food-Grown Selenium Plus is expertly formulated. This important mineral works to optimise glutathione peroxidase levels to support the immune system. Selenium is required for thyroid hormone conversion. In men, it is essential for normal spermatogenesis. Vitamin E has been included in Wild Nutrition`s formulation to prevent the harmful production of free radicals, highly destructive molecules that may alter DNA and cause extensive damage to the body including premature ageing and how well the body responds to insulin. The Food-Grown vitamin E in this product is in the naturally occurring d-alpha tocopherol form, as well as a natural mix of all the tocopherols and tocotrienols found in food. It is thought to be over nine times better retained in the body than synthetic forms. Mineral enhanced Yeast providing Selenium and Vitamin E combined in vegetable oil, Vegetable Cellulose (capsule shell). Take 1 capsule per day, with or without food. If you are pregnant, breastfeeding, taking medication or under medical supervision, please consult your healthcare practitioner before taking any food supplement. We advise taking your supplements a minimum of 2 hours after taking any medication. Below are reviews of Wild Nutrition Selenium Plus - 30 Capsules by bodykind customers. If you have tried this product we'd love to hear what you think so please leave a review.